THE FAITH OF ANNA WINTERS OPENS IN MALAYSIA ON THE 31st OF MARCH AND IN THE US ON THE 6th OF MAY. TO FIND OUT WHEN IT OPENS NEAR YOU CLICK HERE. Here's the investigative journalist Jamie with her brother-in-law Sam who is also a journalist trying to figure out the mystery. Okay so of late there's been quite a few horror movies that take place in Asia, there was The Forest (2016), then there was The Other Side of the Door (2016). The Forest was a purely US production but had its story play out in Japan's famous Aokigahara Forest. The Other Side of the Door on the other hand was a collaborative production between the Britain and India. The Faith of Anna Winters is a US-Singapore collaboration. 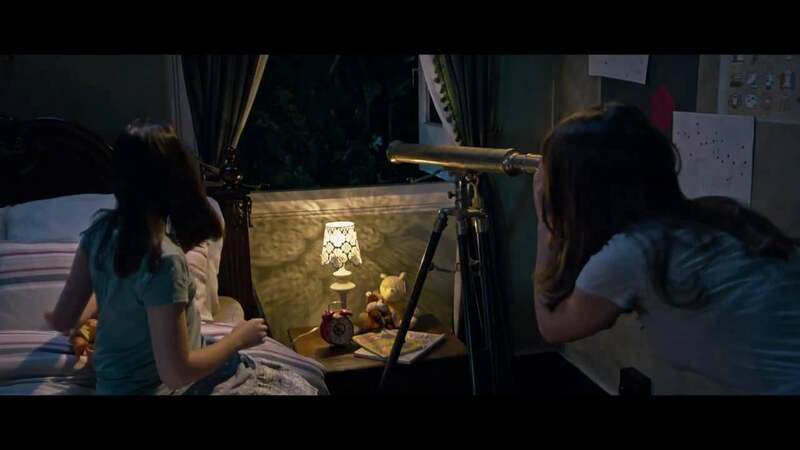 Directed by Singaporean Kelvin Tong this is his 11th directing effort and his 12th time as a writer. The movie begins in the US with us meeting Jamie Waters (Elizabeth Rice) a journalist who is at the hospital waiting for her results. Later at home while going through her emails she receives one saying that her sister Anna Waters (Rayann Cody) who is living in Singapore, has passed away. She immediately cancels all her plans and takes the first flight out to Singapore. Once there she visits the morgue to identify her sister and then heads on over to the police station where she finds out that her sister committed suicide. The requisite market scene whenever a movie happens in an asian country. 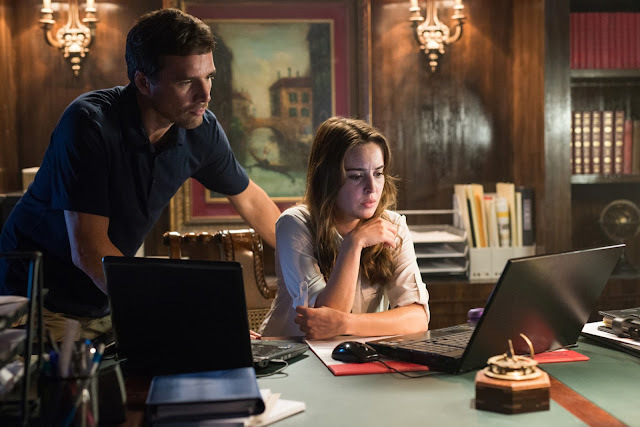 The movie then goes on to introduce us to Katie Harris (Adina Herz) her niece whom she finds out from brother-in-law Sam Harris (Matthew Settle) that she's was found by her mother side, two days after she committed suicide. Katie says she's waiting for mommy to come back after seven days. What follows is a journalist who stumbles upon clues that seem to show that her sisters death isn't just a suicide due to depression but is instead a combination of things unrelated but somehow involves the myth of the Tower of Babel and its rising on the internet, the Leviathan and a promise of resurrection free of disability or disease and a weatherman from the 1800's who moved to Singapore from Britain with his family with a penchant for Satanism and the occult. There's also a white priest who has failed at an exorcism and a Singaporean priest who believes demons or Satan has learned to code and is hacking church websites and talking in binary tongues. So wrap your head around that little plot. Most horror films have a simple and pretty linear plot to follow, someone gets possessed by a spirit or evil thing after moving to a new place, an occult thing gone wrong, the mysterious death that leads to a supernatural mystery, this movie wants to do all that and more. And because it wanted to do more it became a victim of its own lofty goals. Besides the usual horror tropes and tricks which makes it predictable the story is also incredibly predictable but because it tries to add so many horror tropes it becomes a little ludicrous. Drawing from not one biblical myth but two somewhat unrelated ones is bad enough but add occultism and a redemption aspect is taking things a little too far but it doesn't stop there. There's the little ghost boy who tells the story of abuse for occult reasons who communicates through a flashing light in the forest, an etch a sketch, a telescope and a flashlight. A demon who codes and is hacking websites in order to lure sick people but is also really trying to raise the Tower of Babel on the internet who also happens arbitrarily deletes emails right when there are people watching is really silly. Big sister shows up to scare little sister. There's just so much going on that you wonder what the point of the story is. The title says it's about Anna's faith but all you ever find out about Anna is that she left her husband trying to protect him and somehow is approached by the online demon who makes promises to make her better. And she's not the first, there have been other cases around Singapore. The whole thing begins not with Jamie finding out that her sister killed herself but when she surprisingly finds herself sitting on the same chair that her sister was in when she did it. The chair had a symbol on it. The thing is is that you are supposed to believe that she's a hot shot investigative journalist. Which leads me to the next part or the problem of believability with this movie. the continuity and the production design. A few times you'll notice things like an actor who's shirt goes from dry to dripping with sweat to dry again in the same scene. Artifacts that are supposed to be old and left abandoned look very, very good and well kept. There's the scene where father and daughter are running around and discover a skull in the ground of what is supposed to be a child's skull but it's so badly made it looks like a cartoon character's skull. So niece there says mommy will come back, so they're looking for her with a telescope. Then there's the performances which range from passable to bad. I'm not going to point them out but suffice to say that for a production made in Singapore there are quite a few local actors trying to be non-local or maybe that's just me. This movie suffers on so many levels from story to production. I can't honestly say I enjoyed this movie or that I would recommend anyone to watch unless I know they have a morbid curiosity about bad movies. If it had a good moment I can't remember it. I'm going to give this movie a 2 out of 5 but that's because I'm feeling a little bit charitable.